When it comes to high-end communication accessories, the name Plantronics just about always comes up. Typically, Plantronics products are on the more expensive side as they are primarily targeted towards businesses. However, more recently, the company has begun offering an affordable lineup of bluetooth headsets. The Plantronics hopes to entice the average consumer with the Explorer 395 with some inspiration from their professional audio gear. With noise cancellation technology, quick pairing, and a few other features, let’s see if this headset lives up to the Plantronics name. With fairly lightweight and ultra-portable design, the Explorer 395 is easy on the ears. A plastic black-coated body and chrome accents on the center and sides offer a somewhat retro look. Power and volume controls are featured along the sides of the body while a multifunction button for answering and ending calls is centered on top. Unlike most bluetooth headsets that require holding down the multifunction button for powering on or off, the Explorer 395 has a dedicated switch. It’s easy to reach and definitely won’t turn on accidentally. As for the multifunction button, it’s position and size make it easy to locate and press. There’s even an LED status light for indicating missed calls and battery life. 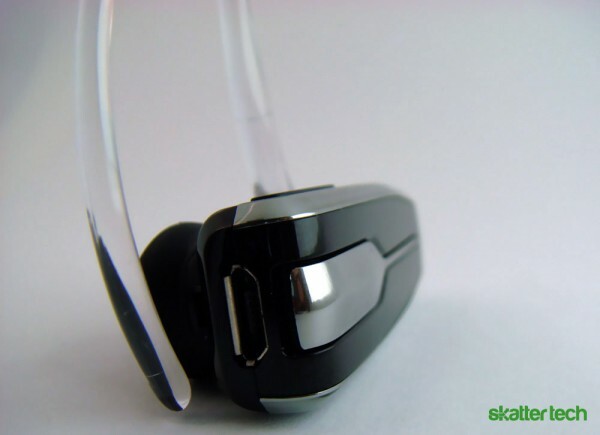 The earpiece of the headset is made of silicon ear gel shaped to fit the inner contour of the ear. The earpiece is virtually unnoticeable and contributes to the overall weightless feeling of the device. 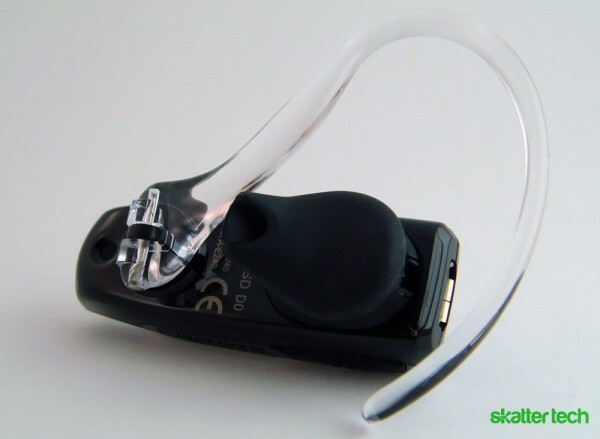 The device attaches to the ear using a clear plastic ear loop. At first glance, this ear loop looks uncomfortable to put on. When I tried it on, however, it was surprisingly light and comfortable due to the size of my ear. People with bigger ears may find it harder to fit, though, as the shape of the loop is fairly set and not flexible. Overall, the way the Explorer 395 is designed makes it a good alternative over cheaper Bluetooth headsets. Its simplistic approach is perfect for those who want to avoid complex sets of functions packed into one headset. Running on a rechargeable lithium-ion battery, the Explorer 395 claims to offer 5 hours of talk time and 7 days of standby. While I do use my phone a fairly decent amount, I was never able to hit the standby limit of the battery. Turning off the headset significantly helps preserve battery life as well. But for the most part, I got past about 4 hours of use in a single day and the headset kept running. But when it does run out of juice, charging the Explorer 395 is a cinch. It comes with a wall plug AC adapter, however since it features a microUSB pin, it can easily charge with a computer as well. 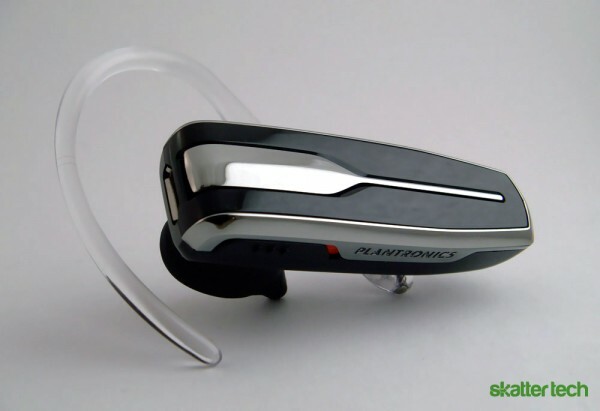 As USB is now the standard for just about every gizmo on the planet, it’s great to see Plantronics featuring it even on their most affordable headset. I tested the Explorer 395 in various locations, including crowded areas with a lot of noise. Throughout my testing, the cal quality was superb. I never faced any choppiness, static, or any other problems. It paired easily, and stayed paired. In fact, I was surprised to find the clarity of the calls better than with my phone’s internal microphone. And that makes sense, considering the headset features built-in DSP Digital Signal Processing (DSP) and a noise canceling circuit. In coordination, these two technologies help reduce external noise from the environment and even reduce echo. I should note that noise cancellation won’t fully dull out the noise of people in a bar or cars on a busy street, but will help reduce those levels. It truly only shines for eliminating small noises such as a overhead fan, air conditioning, or subtle sounds. Adjusting volume is probably the largest issue with this headset. Unlike traditional up and down controls, it features only a single key. Repeatedly clicking on increases the volume until it cycles back to the lowest level. While it may not be an issue for some, having to adjust levels when moving from quite areas to noisy or vice versa makes dealing with the Explorer 395 becomes frustrating. I also was annoyed to find that volume adjustments don’t go into effect immediately. There’s a slight split-second delay between each adjustment. While it is not the end of the world, I’d rather not miss a few words during an important call. When it comes down to buying a new headset, the Explorer 395 is a great choice for a couple of reasons. First, it retains the Plantronics brand-name and it retails for just $49, making it one of the company’s most affordable headsets. Those who shop around can easily find it for as low as $33 on Amazon.While the Explorer 395 doesn’t boast any extravagant features, it gets the job done for those on a budget. It’s even $10 cheaper than the Samsung Modus 3500, which supports plugging in a pair of headsets for music. As states are enforcing hands-free headset laws across the country, it couldn’t be a better time to make an investment. The Explorer 395 is cheaper than a traffic ticket, not to mention safer driving practices as well.